The identifying feature of the aerated static pile system is a grid of aeration piping for forced aeration. A blower or fan aerates the pile. The aerated static pile process consists of mixing of dewatered sludge with a bulking agent (usually, wood chips), construction of the composting pile over the grid of aeration piping, composting, screening of the compost, and curing and storage. 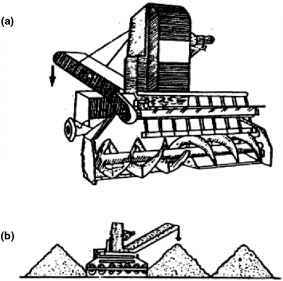 Figure 7.5 shows an aerated static pile process of composting. The aeration grid is usually made of 100- to 150-mm (4- to 6-in.) perforated plastic pipe laid inside a 0.3-m (1-ft) plenum of wood chips. The wood chips facilitate even distribution of air during composting and absorb moisture that may condense and drain from the pile. The compost pile is constructed on top of the plenum. The pile is usually 2 to 2.5 m (6 to 8 ft) high. The entire pile is then covered with a 150- to 200-mm (6- to 8-in. )-thick layer of wood chips or unscreened finished compost for insulation. The forced air provides a more flexible operation and more precise control of oxygen and temperature conditions in the pile than the windrow process provides. It also reduces the chances of developing anaerobic conditions in the pile, which in turn reduces the risk of odors. Air can be either blown into the grid and exhausted through the pile surface or drawn through the surface and exhausted by the fan. The latter method affords better odor control by exhausting the air through a biofilter made from the cured compost (see Figure 7.5). 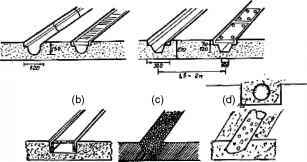 Figure 7.6 illustrates examples of aeration plenum used in Europe. Figure 7.5 Aerated static pile composting. Figure 7.6 Examples of aeration plenum in static pile composting. An active composting period is typically 21 to 28 days followed by a curing period of 30 days minimum. Curing further stabilizes the material. The compost is screened before or after the curing step for recovering of the bulking agent. For ease of screening, it is critical that the compost moisture content not be higher than 45%. Moisture content can be reduced, if required, by an intensive drying step with a higher-than-normal aeration rate before screening. In small facilities, individual piles may be constructed with a dedicated fan for each pile. In large facilities, to make more efficient use of available space, an extended pile is constructed by adding each day's contribution to the side of the preceding day's pile. In a typical operation of the extended aerated pile system, the pile is extended daily for 28 days. The first section is removed after 21 days. After seven sections are removed in sequence, there is adequate space for operating the equipment, so that a new extended pile can be started from the beginning (see Figure 7.7).